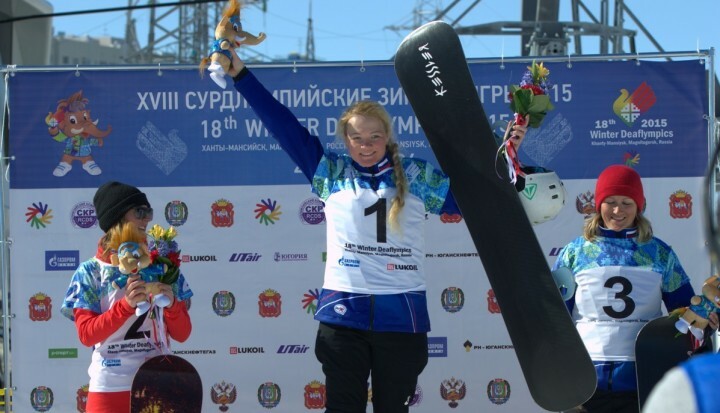 Formidable Czech skier Tereza Kmochova completed her dominant Winter Deaflympics campaign by winning her fifth gold medal in the women's slalom at Magnitogorsk today. She sealed a clean sweep of the women's Alpine skiing events as she finished in a combined time of 1min 16.48secs, which saw her cross the line 2.81 seconds in front of Austria's Melissa Kock, who had to settle for silver once again. Kock's sister Kristina came through to edge compatriot Beatrice Brunnbauer in what was a close race for bronze. But the day belonged to the Czech star, who finished the 18th edition of the Winter Deaflympics having won the super combined, super giant, downhill, giant slalom and now slalom titles. "I thought I could win some medals here but I didn't think it would be five and that all of them would be gold," Kmochova said. "This is fantastic and it is always a pleasure to win." Elsewhere on the final day, Italy's Giacomo Pierbon sealed a hat-trick of gold medals of his own with a blistering time of 1:12.24 in the men's slalom race as he narrowly ousted Thomas Luxcey of France to take the title. David Pelletier claimed the bronze medal, while Kodai Nakamura missed out on a podium place as he came fourth. Elsewhere, there was more news of Czech success in the men's snowboard boardercross competition as Tomás Pazdera took gold in the big final, while American Blair Esson was second and home favourite Alexey Ignatenko clinched bronze. The women's event yielded further medals for hosts Russia as Ella Shevlyakova claimed gold, finishing ahead of Lauren Weibert of the United States, who won silver, and team mate Svetlana Anisimova came through to round off the podium. Russia also secured a shock victory in the women's curling final as they beat heavily-fancied China 9-5 to the delight of the home crowd at the Ice Palace, while Canada ended the tournament on a high with a commanding 10-5 victory over Croatia in the bronze medal contest. Despite the women's defeat, the Chinese men made sure their nation would win one of the curling titles as they secured a tight 7-6 win against Canada in the gold medal match to finish the competition unbeaten, and Russia powered to bronze by sweeping past Switzerland 11-3. In fitting fashion, the last gold medal available went to the host nation as the men's ice hockey team took the Deaflympics crown by virtue of a 6-3 success over Canada to inflict more agonising disappointment on the nation. The result capped off a wonderful Deaflympics for Russia as they comfortably finished top of the medal table, winning 12 golds in a total haul of 30. Kmochova helped the Czech Republic to seven medals overall, six of which were gold, and the US were third with a combined eight medals.